When it comes to color and quality, there are few yarns ever created that compare to Noro's Kureyon (Japanese for "crayon"). Its ultra-soft roving-like wool makes it a joy to knit with, and its luscious colorways make every project a work of art. 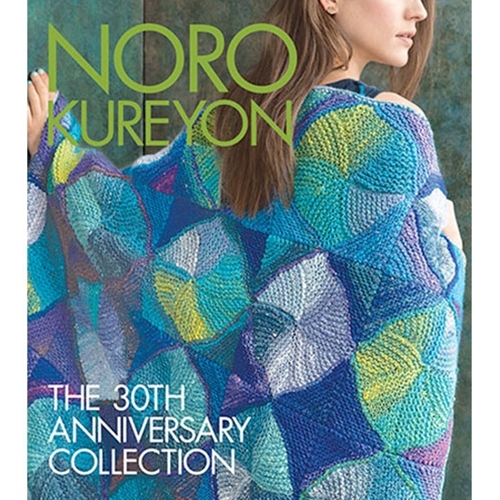 It's no wonder Kureyon is celebrating its 30th anniversary, and it's only appropriate that the latest volume in the Knit Noro collection commemorates this milestone with 30 vibrant projects. Whether looking for something quick like a cowl or hat or ready for a larger project like a cardigan or blanket, Noro Kureyon will answer every need. A show-stopping shawl of neutrals accented with bright earth tones, a multidirectional cardigan that makes the most of Noro's color-striping, a Picasso-esque modular blanket, and a star-motif capelet are just a few of the many designs in this volume that will excite knitters and fashionable onlookers alike.